It’s been a long six years for Wolves fans. Relegated from the Premier League back in 2012, the West Midlands club then followed this up with yet another dismal season that saw them drop into the third tier of English football. Now under the guidance of Nuno Espirito Santo and the ownership of a Chinese conglomerate, Wolves are coming back with a bang. The Wanderers ran away with the Championship title last season, with the likes of Ruben Neves and Diogo Jota leading the charge to promotion. Now with just over a month to go until the new season, we’re all getting a little excited to see what this young side can do against the big boys. Well, the guys over at adidas have gone ahead and stoked that excitement even further, by releasing the stunning 2018/19 Wolves football kits. Wolves have always been famous for their colourful kits, with the vibrant shades of gold and black making them instantly recognisable on the football pitch. It’s an appearance unlike any other in English football, and this season marks the first time adidas have been charged with putting the design together. From what we’ve seen so far, it’s fair to say they’ve absolutely nailed it. The new Wolves home kit brings a return to their classic old gold colourway, which is why adidas are leaning so heavily on the “Old Gold. New Challenge” slogan. With the famous Three Stripes sitting on top of the shoulders and prominent logos on the chest, adidas have put together a football kit that’s bound to make Wolves fans very happy indeed. A simple design is brought to life by the introduction of a brand-new sponsor, with online betting company W88 taking over from The Money Shop this year. 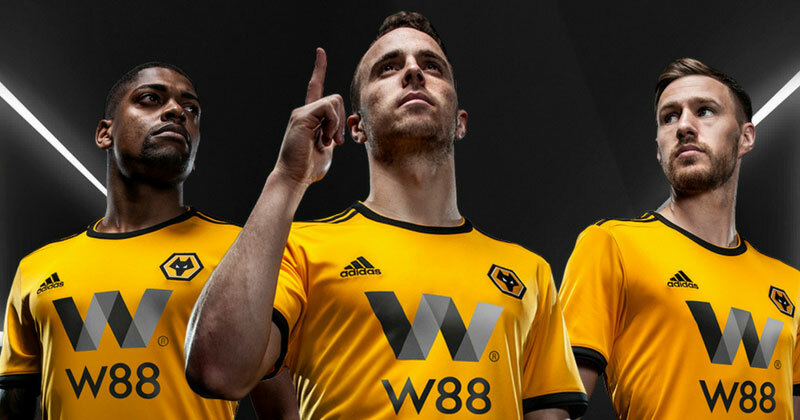 Their bold branding is emblazoned right across the front of the new Wolves kits, adding an extra touch of style to what is already an incredibly unique football kit. As for the 2018/19 Wolves away shirt, adidas have gone for a white colourway that sticks with the same black detailing. While the home shirt harkens back to retro Wolves kits of the past, this away shirt offers a much more modern design which ushers in a new generation of Premier League heroes. According to the official club website, the 2018/19 Wolves home kit will go on sale from 6th July, while the away strip will be available just a few days later on the 12th. It’s completely up to you whether you want to add Premier League patches or lettering on the back; but, either way, you’ll be able to find the best prices on the new Wolves football kits at FOOTY.COM this summer.